Takara Distillery is commonly credited with starting the canned chuhai craze back in 1984. The shochu and citrus juice cocktails were an instant hit, and that segment of the market has seen year-on-year growth almost every year since. 2015 was no exception. After barely breaching the 100 million case threshold for the first time in 2014, the “Ready To Drink” (RTD) industry blasted right through it in 2015 while posting 9% growth over the year prior. Many of these RTD drinks are still made with multiply distilled shochu, but others use vodka as their base. RTD beverages are grouped according to their alcoholic payload. So-called “light type” drinks have up to 4% ABV. “Standard type” drinks contain 5-7%, and “strong type” RTD 8-9%. Also of note is the fact that RTD sales are up roughly 150% over 10 years ago. 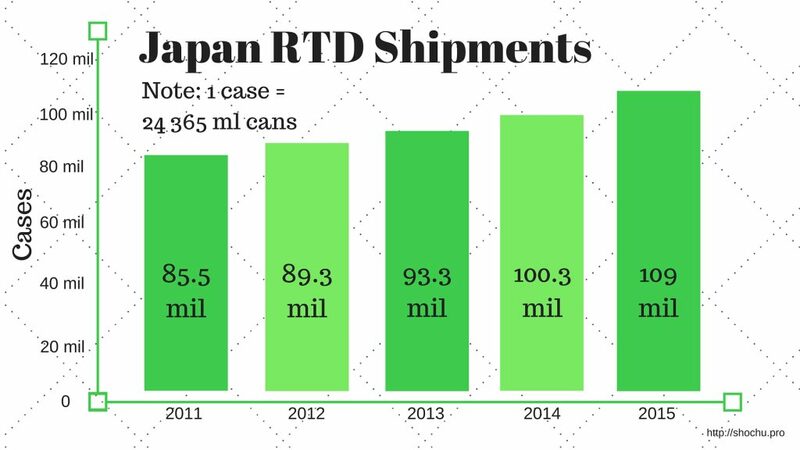 In addition to Takara, macro brewers such as Suntory and Kirin have large stakes in the RTD market. Suntory’s “-196 C Strong Zero” brand was a big hit in 2009 and enjoys growing sales to this day. Growth in this market segment is hurting the same companies bottom lines elsewhere. The same behemoths are responsible for the pseudo-beer craze that has been around for the better part of the past two decades. Sales in that corner of the market, unsurprisingly, have been stagnant.